Regal navy blue 2:1 twin loop wire. This twin wire is 11" in length and 2:1 pitch, (21 holes, 2 holes per inch). 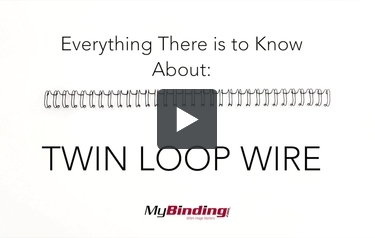 These wires are compatible with any 2:1 wire binding machine or wire closer. These high quality Navy 2:1 Pitch Twin Loop Wires are some of the best wire binding spines on the market today. Also called Wire-O, WireBind, and Double Loop Wire, these navy 2:1 pitch elements let pages lie flat with 360 Degrees rotation for convenient note-taking and photocopying as well as provide a permanent bind to your documents--meaning your pages stay secure and protected. Not only that, but these navy 2:1 pitch wire spines look a tad more refined than a plastic comb or spiral coil. These navy 2:1 pitch twin loop wires come open in a "C" shape, allowing you to insert the spines into your punched pages and then simply use your wire binding machine or wire closer to finish your books. I'm noticing 2:1 pitch twin loop wires in Navy are harder to find. These are needed for my Company, both the size and color Navy, and I'm grateful to have them available!!! !